Panasonic Energy is part of Global Japanese Conglomerate Panasonic. It is one of the largest companies in Japan. Panasonic Energy is in business of Dry Cells (battery). You may have seen Panasonic batteries in retail store or may have used one in your remote or other similar battery consuming appliances. Dry Cells is very niche segment. There are not many companies in this segment. You have only three major players like Eveready, Nippon India and Panasonic. Below are the list of products offered by this company in India. The company products are available pan India and have good presence in market. It will be interesting to see how well the company has performed for investors over the years. Below I have considered stock price performance for the company. As per basics of technical analysis theory stock price reflects very state of a company at a given point of time. So instead of looking across everything under sun just have a glimpse on Stock price. I have considered price from past 16 years. This will eliminate any cyclic fluctuations in price. The price was 38 in year 2002. The price touched 100 and move past it in next 6 years. But like all companies it nose dived during 2008 crisis and moved close to 30 marks. The prices again recovered and touched 100 mark. But after year 2010 the prices started declining and reached near 40 odd marks in year 2014. The next couple of years were great for the company as it moved past 400 mark. So if you look from 2002 price it is at healthy increase of 10 times or so. The best thing about company is consistent dividend per year. At current market price the dividend yield is 3%. The company is consistent dividend payer and with price increase people invested at lower levels have enjoyed good dividend yield. 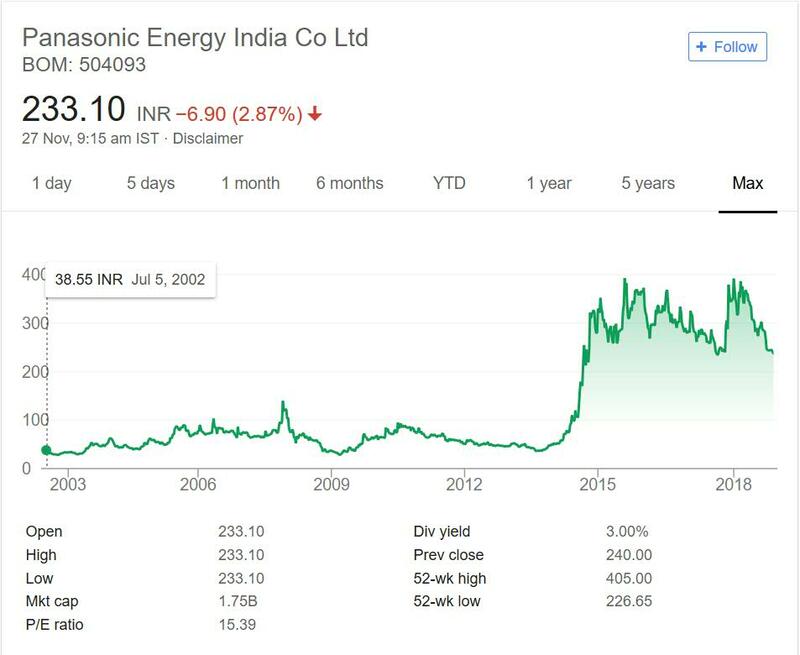 Panasonic Energy is in portfolio of Vijay Kedia. He is one of the top investors in India. It is very interesting pick. As mentioned above this is very niche sector with limited number of companies. There are few factors working for it. First it is part of Global behemoth. So there is no question about management skill and transparency. You can trust the management. The second factor is Dry Cells still have wide range of applications. With Electrification some say its use has diminished. But with rise in Televisions and other similar applications the decrease has been compensated off. It also exports batteries to other parts of World like Africa.With only three major players any growth in market for batteries will play one of these three companies. All of them have good brand presence and power so there is not much to choose from. It is interesting sector to invest in. If you are interested in Dry Cells sector then you can simply track these companies. Since there are only three companies you can add them to your stock watch list. You can then compare them and see which ones performs better or suits your investment. Note other top investors of India does not have any company from Dry Cells sector in their portfolio.